French painter, draughtsman and engraver, active in Italy. The son of a modest painter and godson of Adriaen van der Cabel, he learnt figure painting with Frere Imbert in Lyon. He travelled to Rome in 1715, where he spent much of his time making studies of ships (Paris, Muse des Arts Dcoratifs) and even of Turks and camels (Paris, cole National Suprieur des Beax-Arts). He also trained in the studio of Bernardino Fergioni (1674-1738) and learnt from those artists in the circle of the sculptor Pierre Legros, who was to purchase two seascapes by Manglard before 1719. 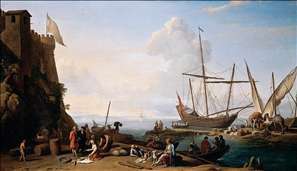 His skill as a marine painter was such that his career advanced rapidly: prestigious clients included Victor Amadeus II, Duke of Savoy and King of Piedmont, who bought two matching pieces from him in 1726 (Turin, Galleria Sabauda), and Philip, Duke of Parma (d 1765), who acquired a pair in 1759 (Colorno, Palazzo Ducale), and the Rospigliosi family in Rome, for whom he produced a number of pictures (Rome, Museo Nazionale Romano). Manglard enjoyed considerable academic success, becoming a member of the Acadmie Royale in Paris in 1735, and of the Accademia di San Luca in Rome in 1736 the following year. He was also elected to the Congregazione dei Virtuosi del Pantheon in 1741. He enjoyed also the patronage of most of the leading Roman families, including the Orsini, Chigi, Colonna, Rondanini, and Rospigliosi, as well as patrons from further afield such as Victor Amadeus II Duke of Savoy and King of Piedmont, and Filippo Bordone, Duke of Parma (who alone commissioned more than 140 works from Manglard to decorate his palazzi). See more details about "Coastal Landscape"
See more details about "Mediterranean Harbour Scene"